Sky and Water, by M.C. Escher, is a tessellated image of birds changing to fish when they sink below the water line. Depending on whether you see the background or foreground as dominant, you see either fish or birds at the water line. To me, this image represents the relationship between internal and external learning consultants. 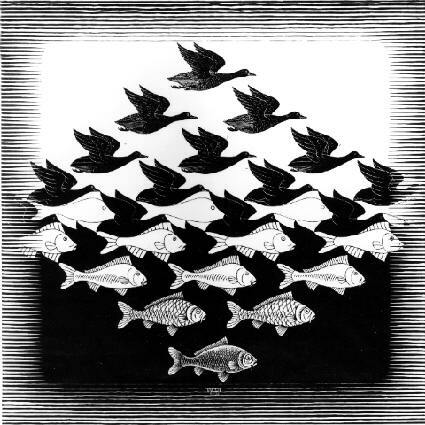 Like the birds and fish in Escher’s image, internal and external consultants are really one and the same but have different environments. External consultants are the birds in the image, independent agents that swoop into organizations to provide a wide array of services in workplace learning and development. They are contracted as needed to provide such services as assessment, training, performance intervention, and evaluation. After their work is finished, external consultants migrate to other organizations in need of their specialized knowledge. Although most consultants are external, we are beginning to see a larger number of internal consultants (fish) who perform similar duties but are permanent organizational members. They act as business partners guiding their organization toward optimal performance and work in areas of human performance improvement, training, and organization development. What do think are the main advantages and disadvantages of internal versus external consulting? Which area interests you — would you rather be a bird or a fish? Why? At this stage in my career, it is difficult for me to identify a preference to be an internal consultant vs. external consultant. think, just as with anything, there are pros and cons to both. Now, I am working as an internal consultant. Some of the benefits include knowing the organizational culture well because I am a part of it, having relationships that I can leverage to benefits my work’s outcome, and having the time and opportunity to go back and measure the effectiveness of my work by seeing the actual results of it. Some of the challenges include members of the leadership team not wanting to expose their challenges to a “lower level” role and navigating the politics of different departments. In the future, I do plan to work as an external consultant and some of the benefits that I anticipate is being able to see things with a “fresh perspective” because I am not a member of the organization, having experience from a number of projects and organizations that I can leverage for my work with my clients and flexibility in my schedule. As far as challenges, there is the “outsider” view that members of the organization have and they may not provide you with the full detail, resources, time needed to complete a project optimally, and the need to invest more time in the front end to establish trust and credibility with the client (which happens as an internal consultant also). That’s one of the reasons that Block’s text has resonated with me so well, I think if you lead with authenticity in your consulting approach, whether internal or external, you are well-positioned to consult in a positively impactful way and have fulfillment from your work. I must express my lack of desire for being an internal consultant. I find that internal consultants are often hampered by the environment in which they’re employed and trying to consult within. I almost find this a conflict of interest. Where the advantage is cost-savings for the company and certainly an internal consultant would have great understanding of the culture of their environment, they are not shielded by the bureaucracy and internal politics that might be at play. I often find these are at the source of culture problems within an organization. I feel impartiality in this role would be very difficult and that there is incentive to not be fully honest or transparent about the issues they may uncover, particularly if it involves upper management and the leadership team that could result in retaliatory measures. I have always been in favor of being an external consultant. In this role, I am more or less impervious to those internal influences internal consultants have to tango with. I can be fully honest and transparent in my assessment of issues I uncover there and my impartiality would be all but assured. Also, I find this to be less boring. I want to be able to experience many different environments and organizations, constantly interacting with diverse people all with unique problems to solve. I feel as an external consultant, my perspective and experience would be far more enriching. This is a really interesting question. I would rather be an internal consultant, mainly because I really like team environments. Also I would rather be a fish lol, but I have a very long history of wanting to be a Mermaid. I think one advantage of being external is that you come in with fresh ideas and perspectives. Likewise I think the disadvantage of being an internal consultant is that you are in the system and you have adapted to that system. If I was in the need of a consultant for a company, I would probably use both depending on the situation. So nice to see familiar faces on the post, I’ve had classes with some of the names that appear even 3 years ago. Thanks to the professor for the idea on keeping traffic coming to an old blog post! What immediately comes to mind is what I have heard of internal consultants. They do have a regular gig yes, and a steady work week schedule but that comes with a cost, and for me the cost is too dear. There is alway’s a lack of respect for internal consultants. i don’t believe I would be subject to the same amount of disrespect due to my credentials and the way I carry myself, however, the thought of being locked in to the same sets of problems, and same cast of characters would run the risk of being dull to me. Although the establishing of relationships with the people within the company would possibly off set that. Hopefully we are so good at what we do that we don’t have to be as concerned when the birds next landing spot is nowhere to be seen. I can definitely see the appeal of both. Internal consultants have the comfort of being an insider. You have previous knowledge of the skills gaps, systems put in place, and the key players of the organization. Those a great things. However, when you are already involved in the organization, sometimes it’s harder to get a birds-eye view of the problem at hand. If you can’t see outside the system you’re involved in, I feel that it may be harder to implement those changes. For an External consultant, you have that ability to see outside the scope. What I do think is great about external consulting is the opportunity to broaden your knowledge on a variety of fields. A disadvantage is being assigned as an outsider before you can even make the changes. You have to establish that trust early and depending on how long your are able to stay and implement those changes, the chance may never come. This brings resistance to change when you cannot establish that trust, making the change harder and harder to implement. At this point, I’m leaning more toward external consulting. Again, the opportunity to expand my knowledge and help in a variety of fields seems very exciting to me. What do think are the main advantages and disadvantages of internal versus external consulting? Which area interests you — would you rather be a bird or a fish? Why? I believe that the advantage of consulting internally is that you have already established credibility in the company. You already have the relationships and know who you need to tap to get the work done. You are able to establish buy in, engagement, and collaboration faster. External consultants have to have the skill set to come into the company and establish relationships, and commitment quickly. They are often seen as the outsider or the person coming to take my job away from me. They already have three strikes against them walking in the door. What I have witnessed is that they establish the relationship with the leaders quickly however, it’s normally the line managers that they have to work with. I believe if they meet with everyone at the same time so that the line managers can see that the leadership is onboard they have the tendency to align to the purpose. I have been the fish so I am willing to step out there and be that bird. I think that it has been very helpful to be the fish first this has prepped me for the challenge of being the bird. I think that the major disadvantage of being an internal consultant is that you are part of the organization that you are trying to fix. Therefore, even though you have access to internal data, that may not be effective enough as you are entrenched and linked to these issues. That is why my preference is to be an external consultant so that judgments about implementing interventions can be done without all the office politics. Also, it is my impression (as an external consultant) that not having the interpersonal ties, one gains by being part of an organization, does help or is an advantage, when making the “tough” decisions when trying to improve the overall performance of the organization. I would rather be an external consultant. Being an external consultant I would be able to experience different organizations and cultures and gain new skills while improving my current ones. Advantage of external is that you get to experience different people, places and organizations. The more you know the more you grow personally and professionally. Advantage of internal is that you can grow at a steady rate as the organization grows. Internal consultants don’t have to go looking for their next gig. Disadvantages of external, looking for the next gig, never know what you are going to encounter. Disadvantages of internal, one could become stale in their field/profession, less experiences contributing to growth. More importantly I think that personality has a lot to do with whether someone would be a better external or internal consultant. What a clever analogy to the world of consultants! I’ve earlier heard internal consultants being described as frogs in a well, but I am liking the comparison of fish in water and birds hovering above better, it is more insightful. Whether one chooses to become an internal consultant or an external consultant, depends largely on who they are, as a person. Are they someone who enjoy facing new challenges each day, or would they like to be the keeper of one giant puzzle. In one way, they contribute towards an industry, and by sharing and bringing to various organizations, experience and wisdom. In another, they have the potential to affect the shape of one organization. I would probably like to be an external consultant, just for the sheer joy of learning about the industry and broadening my knowledge and problem-solving skills. After maturing there a bit, I would like to settle with one organization, and contribute towards its success, when I know I can effect positive changes. Thank you for a thoughtful article! Great article! From what I understand, external consultants very much appreciate a projects life span. Meaning, they enjoy the project as much as they can while the project is in motion, but look forward to achieving said goals, then moving on to a new project/client upon its completion. Some people like variety, in purpose and when partnering with people. Internal consulting seems a bit more stable/consistent, if the organization really welcomes and believes in change and growth. I have heard of unfortunate internal consultant situations where it sounds like the company added internal consultants begrudgingly, as opposed to genuinely support organizational growth. I am interested in both at this moment. For me it is too soon to make a definitive answer. I am open to both options. Perhaps by the end of my 8 week consulting course, I will be more drawn to one over the other. Unfortunately I do not have the same enthusiasm about working as an internal consultant. I definitely agree that the main advantage is having knowledge of the organization, firsthand. However I think the main disadvantage is the company culture. To remain totally objective, one must somehow remain untouched by the culture, and all other company politics. If one can navigate this, I think being an internal consultant is not bad, but for me, I would like to remain on the outskirts and become an external consultant. It’s a great analogy; birds and fish to external and internal consultants. Of course there are advantages and disadvantages of both, but I think Peter Block really hit the nail on the head in Chapter 7 of his book, Flawless Consulting. He included a chart listing the noticeable differences between internal and external consultants. He listed such monumental differences such as the clothing they wear and the difference between their personal and fantasy lives. The point Block was making is that although internal and external consultants come from a different point of view, at the end of the day, they have the same goals and can/should follow the same steps in order to reach those goals. This was an important realization for me, because as an internal consultant myself, I tend to read or learn about consulting strategies and think ‘that must be for the external consultants, because that would never work working within an organization…’ The truth of the matter is, that although it might be more difficult (to confront problems, make your own demands clear, etc) it is just as important for the internal consultant to overcome these challenges as the external consultant. Internal: stable, predictable, can focus on problem identification and problem solving, sometimes a lack of variety with projects, you know where your next paycheck is coming from, feeling of working with a team. External: always a new adventure, in a solo shop spend as much time or more always hustling for new business, lots of travel, can feel isolated, novelty of projects, a lot of freedom to choose what you do. I consider myself currently to be an internal consultant for my department – I have been lucky that my day to day challenges always keep me interested. I like having a predictable pay schedule and knowing what city I am in on any given day. I want to be a FISH! I think internal consultants have an advantage to really shape a culture for the long haul and see the most impact. The relationships that they are able to build are going to be very strategic. I like to plant roots and really get to invest in others and systems and be able to see improvement and continually tweak and learn from an environment. Internal consultants for the most part can be home more and do not have to travel as much. External consultants have the advantage of seeing with fresh eyes but often do not know the culture enough to really make a difference. Even though some may say that is advantage as well because they do not fall into the FIXER mentality. They can genuinely rely on the team to do the “heavy” lifting. Externals get to build a vast network but the travel may take a toll. I think a huge advantage of working internally is to be able to grow in your field right along with the organization. I imagine being an internal consultant also has its benefits of being recognizable within the organization and having the opportunity to be solely responsible for positive change. On the other hand, you could really grow a portfolio by being an external consultant, and be more in control of your career by obtaining new clients with an impressive background of overcoming a plethora of organizational issues. I would personally much rather be an external consultant mostly because I would be able to experience more on a regular basis. I’m afraid my skills would become stale in a single organization. Hi Bryan — your last statement about skills becoming stale was really highlighted by my recent interview of a consultant who had been an external consultant and then switched over to being primarily an internal consultant. It wasn’t so much that skills became stale, it is that the variety and the ability to pick and choose goes away when you become an internal consultant. The three main advantages of being an internal consultant are follow-through, relationships and a steady income. By follow-through, I mean the consultant is more likely see the project from beginning to end. An external consultant might help develop and implement and idea, but won’t necessarily be there long enough to adjust a workflow, system or idea after it has been extablished. Relationships: An internal consult has a day-to-day rapport with employees and managers, and, likely, a stronger familiarity with the company itself. Steady income: Freelancing is tough. A lot of the job is hustling new clients and gigs. That takes discipline. With a steady paycheck, you can focus on the work itself. The main — and huge — advantage of being an external consultant is credibility. The external consultant is more apt to give unbiased feedback since they are not as tightly beholden to the company. Ths position allows truth to power with fewer consequences. People are more likely to believe you if you don’t have an agenda or are, at least, open about that agenda. Bird or Fish… that is the question? On one side I believe internal consultants have the opportunity for longer term relationship building, less red tape to address (when you know who to go to) and easier executive buy-in (when you personally know who are the power decision makers). Given to my personality, I believe I would do best as an internal consultant. Company success and pride are important to me, being part of the bigger picture, contributing towards a common goal and making a difference in my team also go hand in hand for me. As an external consultant there are more office politics to navigate (who is responsible for what), trust needs to be established (consultant needs to live up to reputation/recommendation), there is a financial liability factor (once contract is up and so is the assignment) and a consultant may never feel like part of a team (given the temporary nature of assignments). The offset is a sense of freedom (not serving one lord per se) to explore various industries. I would say that advantage would be you have a broader range of opportunities. You always know that you only have to deal with certain people for short periods of time especially if you find your self in an unpleasant situation. Knowing there is light at the end of the tube is a good situation to be in when the environment is not one you would want to deal with for a longer period of time. For this reason if i was a consultant I would be fishing around as often as possible. The advantages of being an external consultant include an easier means of remaining objective with regard to analysis and consulting process. Having been a trainer who traveled from site to site for many years, there is something to be said for coming into an organization, learning to recognize where issues occur in the department or organization, providing the service to the client and then leaving! The disadvantages, most definitely, include the fact that one is away from home 3/4 weeks or 5/7 weeks, etc. That part of it is tough if one has a family and/or pets. I enjoyed reading the analogy you provided with contrasting the roles of internal and external consultants. As an internal consultant you have the advantage of knowing the business, strong interpersonal relationships and context for the problem. The relationship an internal consultant has with internal customers is a double- edged sword as often the internal consultant is not viewed as a consultant. It has been my experience, as an internal consultant that there are times when my role as a workplace learning professional is treated with placing orders for prescribed solutions versus a collaborative effort to design solutions for organizational problems. An external consultant is often treated with a higher level of regard for their expertise. They are looked to as problem solvers and the best solution finder for what ails the organization. The disadvantage is that externals are often viewed as externals. It can be a challenge with getting the client to open up and uncover the many layers, context and situations that have caused the organizational problem. In my current role, I am comfortable with being a fish. I am still developing my consulting skills so I prefer to hone my skills as an internal consultant before venturing out of the water. I am currently leaning towards the advantages of being an internal consultant. It is valuable to understand the industry, have familiarity with the key stakeholders, and an intimate knowledge of how the company works and what it is working towards. Internal consultants can also build trust and confidence in their ability to successfully facilitate meaningful change on an ongoing basis. Being an internal consultant can be challenging because personal friendships or relationships can sometimes stand in the way of progress. Coworkers may feel like they have an ‘in’ with the change agent because of familiarity. In turn, this can be viewed as an advantage for an external consultant because they are only present for a short while and their only role is to be the expert/agent of change. External consultants can be challenged if they receive too much or too little information or if they don’t have access to the complete picture. I would rather be a fish because I feel like I could get more done and drive positive change (when needed). I love this analogy! And it’s so true. As an external consultant you’re swooping in and out experiencing different organizations, processes, and cultures. As an internal, you are still experiencing the different processes in the different departments as you are already aware of the companies history, struggles, culture, etc. For me, I want to lean towards being an external consultant because of those different experiences to gain along the way and I don’t want to deal with the politics involved of being an internal consultant where you have to deal with internal people and their possible judgmental views a long time after a project is done. Thank you for the great visual! Being an Internal consultant has the stability of being stationary ( company wise) and financial security. You can also see a project from the beginning all the way to the end and even beyond. The only draw back to being an internal is that you are limited in your exposure and learning exposure except for the fact that you can get some exposure by being loaned out to different departments. Being an external consultant allows you to work in many fields at many different companies. It also allows you to gain new experiences and pad your professional resume. One of the drawbacks may be that you can not grow with the project in the years to come and that you don’t have a home base. You can have disadvantages dealing with so many organizations and the way they operate and client cooperation. All in all Stability is very important to me as a single parent. I need something that has the financial security I need as well as the stability of the internal consultant. I agree that being a single parent warrants security and I also want to consult while I have to keep in mind that consulting can have its unstable moments dependent upon the area of expertise the consultant business offers. if the area of expertise is does ot fit multiple industries, profitability may not be stable. This is a great visual! I think the main advantages of internal consulting are being part of an organization and being tied to the mission. You can reap the rewards of a positive implementation. I think the disadvantages can be a lack of exposure to different organizations and different solutions. I think the main advantages of external consulting is being able to help many organizations and gain exposure to many different types of organizations, problems, and solutions. I think a disadvantage is the inconsistency of a routine or schedule and the traveling. I would prefer to be a fish – swimming with the organization – rather than swooping in and leaving. I am loyal and I look forward to adding value to an organization I care about. Whether an internal consultant or an external consultant, depends on where I am in life’s circumstances. Sometimes circumstances dictate the need to have a regular payday, regular hours and even regular team of work mates. Then again, a consultant may want the flexible schedule of an external consultant, the opportunity to garner a large fee or the variety of working with an ever changing diverse team. As an external consultant one must really be adventuresome, have huge desire and practiced people skills to go after potential clients and get the job done. As an internal consultant you brave the familiar as you strive to make an organization better. I was impressed with the analogy used in this post. The article made me think deeper about why I wanted to be an internal consultant. The advantages of being an internal consultant provides the opportunity to see the growth within an organization. I also like the ability to see and hear what the strategic focus is and help to create a plan on how to accomplish that vision. It can also allow me the ability to physically see the successes and potential failures of a project as it is implemented. I feel that that a main disadvantage is personal growth. I am not opposed to being an external consultant. I can see how the advantages around consulting externally would help to gain the knowledge and experience. It also allows the opportunity to network and meet different people. I do feel that the main disadvantage here is implementing the process of a plan and not seeing the accomplishments or challenges that evolved. Since I am still open to potentially consulting externally I am interested to see what others say could be the advantages to external consulting so I can determine which avenue I would confidently say I would do. My problem solving nature and need for variety tell me that external consulting might be a better fit for me. But, as much as I enjoy travelling for fun, I don’t want to have to travel for work as much as I think this could demand. Plus, I would want to see results played out over time (am loyal and get attached)! This transitions nicely to the other part of me (am a Gemini!) who has a natural inclination to manage (develop) things and who feeds off relationships / being a part of and collaborating with a team. In these ways internal consulting would be more for me. The “but” on this side is that because of those same things being an internal may be too slippery a slope for me to navigate and stay successful, as it can make for some really blurry lines and a lot of boundary making and maintaining. I not sure I would want those types of challenges mixed in with the task at hand. So… bird or fish for me? Well… is seems to depend on how I focus my eyes (or brain in this case). We will have to wait and see! You certainly have a lot to think through around internal/external consulting. Maybe some opportunities will come about that you can do both types of consulting to get a feel of what might be the best fit for you. What a great analogy. Here is a perspective. Consultants who swoop in and out of an organization do so because they have a specific skill set that is needed only for a specific problem. If I had such specific skill set and enjoyed new challenges every 3- 6 month then bird would my choice. I see myself more as a change management consultant, leading a specific task force for organizational development and bringing together the main business functions of production/services, accounting, marketing, human resources and information technology. I could be seen more fish than bird; Swimming below the waterline, swimming in tune with the different flows of water and coming up once in a while to get fresh air back into the organization. I would prefer to see a business grow and work on further strategies for expansion. For that I want to be located close to the waterline, so that I can switch between the role of a consultant who works on a project in another market (country, product, and/or department) and the consultant who is a constant in the company as a whole. In other words I would be fish and fowl. I would rather be a bird because you get the opportunity to train many different organizations in with your expertise and watch many different organizations soar because of the knowledge that you bring to the organizations. Organizational development is the area that interests me the most and internally it can do wonders for that organization, but externally it can help so many more organizations. I want to help as many people as possible which is why consulting externally appeals to me more than consulting internally. I like how you indicated that you would like to stick at the waterline. This provides flexibility to go either way with being a internal or external consultant. There are certainly both positives and negatives around being internal or external consultants. I feel like internal is best for me but I do feel like with external I could become a little more specialized. First, I love this analogy because it fits so perfectly. I have spent most of my career as an internal consultant or a fish and I feel most comfortable in that role. The advantages of being an internal consultant are that there is a steady paycheck, a consistent team of people you work with, an opportunity to try new things and being present when projects are completed. The biggest drawback I see is that being with the same organization may get boring. And external consultant has many advantages: the work is more exciting because the consultant would change clients and projects more often; the consultant would be seen as a true expert in her field because she would concentrate in one area; she would build a large network. Some disadvantages would be having to go out and get business, not having a steady income, not really being a part of a consistent team. I think I would enjoy being an external consultant if I could get over my fear of not having a steady paycheck. Once a consultant is established I’m sure the jobs come one after another. But for now I will stay a fish and keep swimming. Working as an internal consultant the min advantage is having the necessary knowledge to navigate through an organization. Internal consultants are well aware of thier resources and the limitations that may affect a project. The main disadvantage is that the “norm” may not be challenged and it may be difficult to bring fresh new ideas to the table. As an external consultant is almost opposite of the internal consultant. External consultants have the advantage of being an outsider looking in and able to assess sitiuations in a different manner, therefore bringing fresh new ideas to the client. On the flip side, the disadvantage is not knowing how to navigate an organization. External consultants have a very limited view of an organization and may not always be introduced to the resouces they may need to be successful. Internal consultants have the advantage of having a better understanding of an organization’s culture and way of doing things. An internal consultant will have valuable insight when it comes to the implementation of changes throughout an organization. They may be better equipped to understand and deal with resistance. However, it is a disadvantage that they will have limited exposure within their field. There are several advantages to being an external consultant. One example of an advantage is objectivity. An external consultant will be able to provide a new perspective and may help to uncover issues that need to improve when insiders see these things as the status quo. Additionally, external consultants are challenged with a wide variety of problems and situations. They also work with various companies and numerous people. I believe this wide range of variability gives them a greater level of proficiency. However, it is a disadvantage that the consultant may receive inadequate feedback in regards to how the changes implemented have continued to effect the business over time. I would prefer to be an external consultant. I enjoy field operations and would love the broad range of experience. I would choose to be a fish; an internal consultant. I think internal consultants have somewhat of an advantage over an external consultant because they are ‘in house’ and most likely know the ins and outs of the organization where as an external consultant would have to take some time to learn about the client before they can do any work. Hi Euellmr! I have the same outlook as you on internal vs. external consulting. I also feel internal consultants have an advantage as well as more passion in the work they do, due to being emotionally invested in their company. Thanks! After reading about internal and external consultants, I feel the advantages of internal consulting are getting well acquainted with colleagues and having a genuine interest in benefitting the company. However, disadvantages include limited variety in projects and limited exposure to industries. In my opinion, advantages of external consulting are broadening your consulting experience by working on several types of projects with different clients, as well as building your professional network. Disadvantages of external consulting include never feeling attached or connected with client-employees. I would be interested in being an internal consultant, being a fish, because I feel there is more stability and consistency in that job opportunity opposed to an external “bird” consultant. Stability is very important to me in feeling settled in my workplace. If I felt there would be frequent movement, it would be difficult for me to feel emotional investment at work. Being an external consultant definitely has its benefits in terms of broadening your experience because you have the opportunity to work with so many different clients from all different fields which will help to expand your client base and build your reputation as a consultant as well. Great comment!